The Summer Reading Program is proud to present Mr. Jim Jayes! 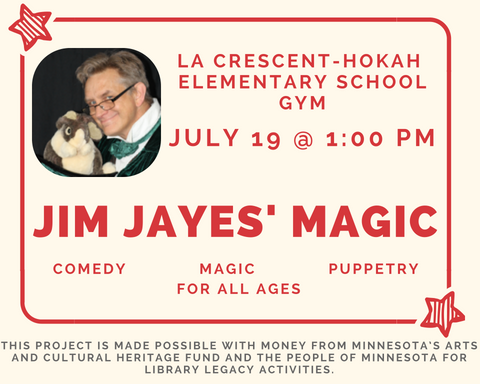 Jim Jayes has been entertaining with magic, puppets, and his own special brand of comedy for over 30 years. Based out of Austin, MN, Jim travels all over the state entertaining audiences of all ages. Join us in the Elementary School Gym for a fun-filled afternoon performance!